The new annual catalog from Stampin' Up! is here and it's gorgeous! 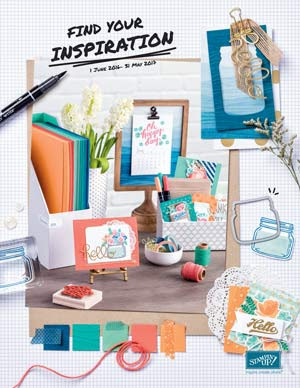 Whether you are new to stamping or a long time crafting enthusiast, you'll find the perfect project inspiration (and the products to create them) within the pages of this catalog. View the catalog now. Love free products? 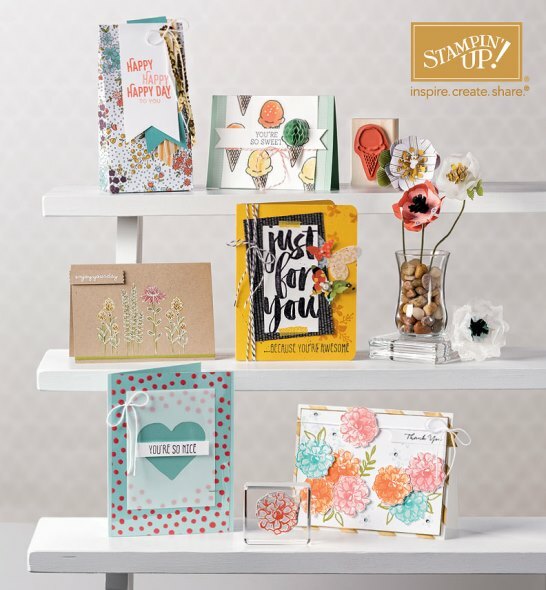 Place an order of $150 or more and receive Stampin' Rewards to spend as you choose. 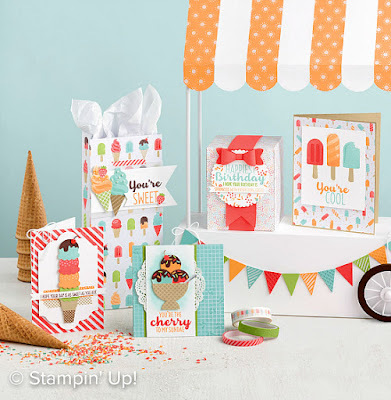 Get an extra $35 in Stampin' Rewards with orders of $350 or more through June 30! This includes all individual customer orders (online or in person) as well as group/party orders. Happy New Year! The holidays are over and the most wonderful time of the year has come and gone. Or has it? 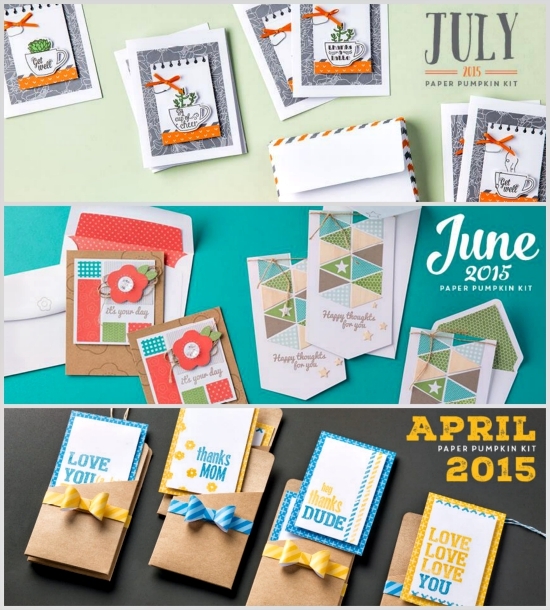 For those of us with a passion for stamping and paper crafts, the most wonderful time of the year starts right now! 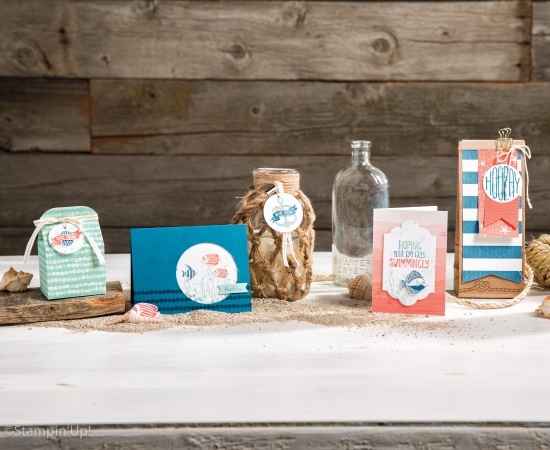 Today is the launch of the Stampin' Up! 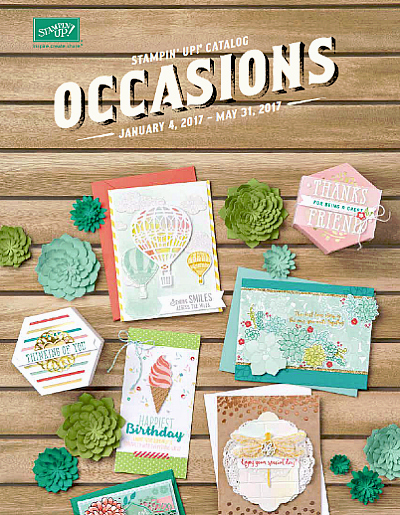 2017 Occasions Catalog AND the 2017 Sale-A-Bration promotion. I'm so excited about all the new stamps, gorgeous papers, fun accessories, and creative project ideas being introduced today. 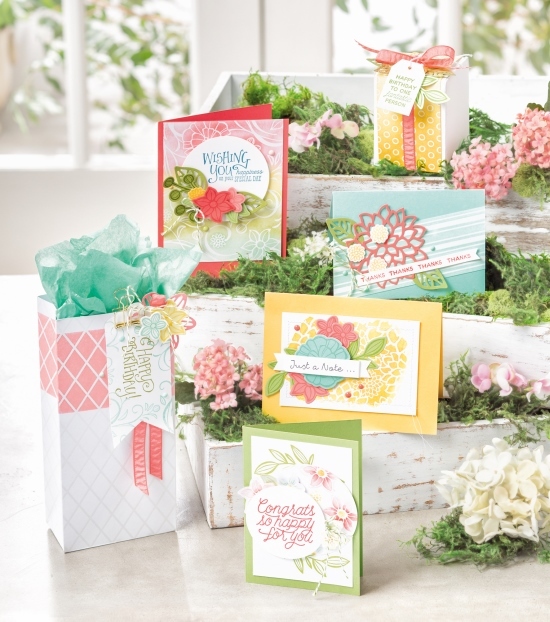 I'm loving all the new birthday suites and bundles, the adorable Basket Bunch Bundle for Easter, the stunning Falling in Love Suite, and I can't wait to start coloring the Mediterranean Moments stamp set using the new Watercolor Pencils. View the SAB Brochure here. 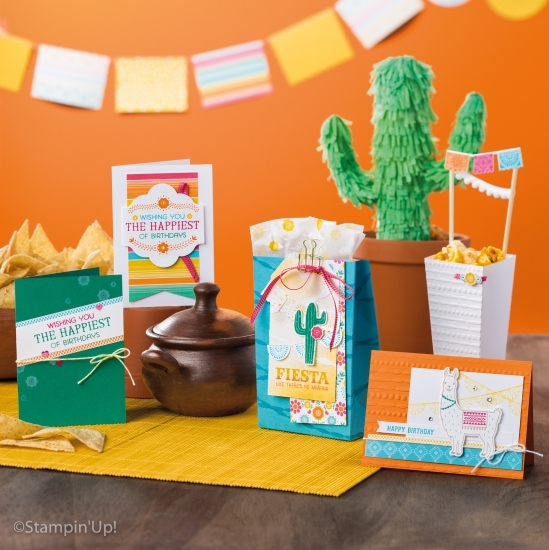 Truthfully I want it all, but I'm dying over the cute Tasty Trucks and Hey, Chick stamp sets along with the cool card tin and that gorgeous Metallic Ribbon combo pack. This year, the Sale-A-Bration promotion runs from January 4-March 31, 2017. Be sure to take advantage early, as product availability may be limited toward the end of the promotional sales period. But ... we might just get a few new items to choose from for the last several weeks. Yay. Remember: During Sale-A-Bration, there are THREE ways to earn free products! 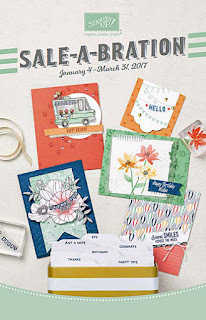 Shop to earn Sale-A-Bration items (choose one free item from the brochure for every $50 you spend on Stampin' Up! products). Join to get additional free product in your Starter Kit (two free stamp sets!). 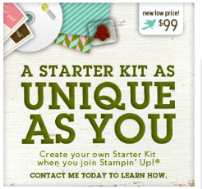 Host a qualifying party to get more products with Stampin' Rewards. I'd love to know what is at the very top of your wish list. Let me know in the comments below. It's always fun to try and guess what the most popular items will be! Woo Hoo! It's time to get this party started. Now that we've all enjoyed the most wonderful time of the year, we get to enjoy the most exciting time of the (Stampin' Up!) year with Sale-A-Bration. SHOP! 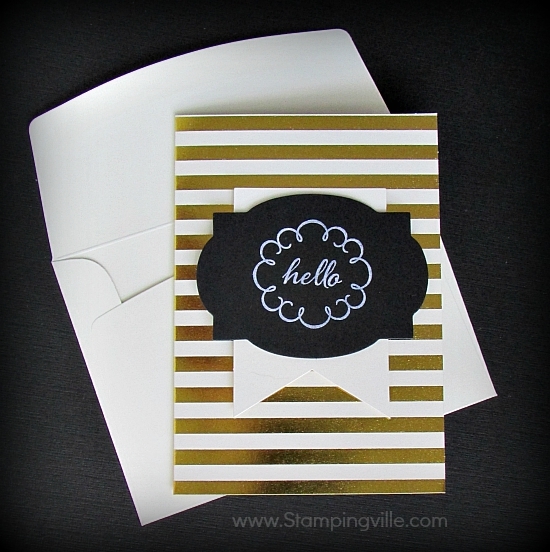 For every $50 you spend on Stampin' Up! products (before tax and shipping), you get to choose one free product. It's the perfect time to purchase products you've had your eye on or brand new products featured in the Occasions Catalog. HOST! It's a great excuse to get together with friends and have a fun and creative time. 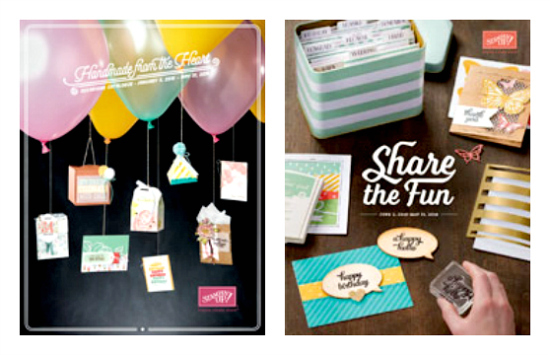 Host a qualifying party during Sale-A-Bration and earn $25 more in Stampin' Rewards! JOIN! 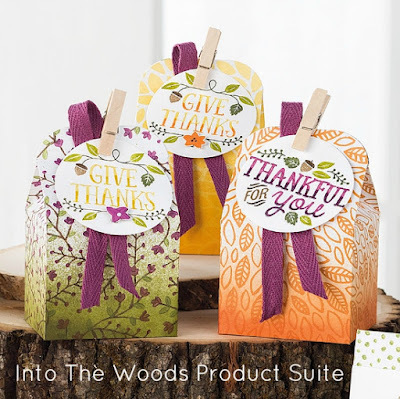 It's a fabulous time of year to join Stampin' Up! During Sale-A-Bration you can become a demonstrator for just $99 and choose $30 more of free products for your Starter Kit. That's $155 of products for only $99 and the kit ships for free! 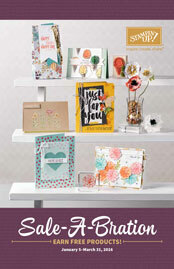 Get started now by creating your wish list of must-haves from the new Occasions Catalog and/or the Annual Catalog. Next, you'll want to pick out your favorite Sale-A-Bration products. And the last thing to do is place your online order or contact me personally for ordering, scheduling a party or to join Stampin' Up! How was your Labor Day weekend? Did you have any time for crafting? I managed to sneak in some craft time on Saturday preparing my project for our Stampin' Up! team meeting and swap. The meeting was on Sunday, so I logged a few more hours of fun crafty time that day as well. I'll be sharing a few of our swap projects soon. I think I even have a few projects to show you from the previous meeting as well. Duh. If carving out some time for papercrafting is something you struggle with, I highly recommend Paper Pumpkin - the monthly papercraft kit from Stampin' Up! These all-inclusive kits come with everything cut and ready to go. There is always a little stamping to do and then you simply assemble the projects. It just doesn't get any easier (or quicker) than that. Paper Pumpkin kits always include a stamp set and mini ink pad(s), along with additional supplies to create that months project. Typically, there are extra supplies in the kit which means that a) if you make a mistake you aren't totally screwed, or b) you can use the extras to create your own variation of the project or c) you can just add the extras to your stash for future use. The August Paper Pumpkin kit - Chalk It Up To Love - was super cute. Those little boxes with the paper flower? Totally a-DOR-able! The cards are very pretty as well, with the shiny foil print on each of the two designs. Paper Pumpkin kits usually ship around the 12th of each month and a few days later is when I start stalking the mailman in anticipation of that little red box! It's like getting a present every month. I love peeling back the layers of tissue paper to discover what is waiting for me inside that box. And the stamps and projects seem to be getting cuter and cuter each time. Every month I say "ooh, this one is my favorite one yet" and it is - until the next month when it happens all over again. Ha ha. My recent faves (pictured above) basically prove this point. See? The most recent kits are my favorites. Six months from now, I'm sure I'll have new favorites. Your first kit will include a clear-mount acrylic block. 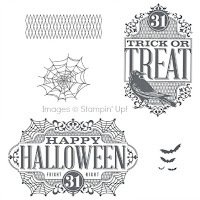 You will need your clear block each month to use the stamps that will come with your Paper Pumpkin. Subscribe Now to Paper Pumpkin! I really do love Paper Pumpkin. It allows me to just simply enjoy creating the projects that have been thoughtfully designed for me. I get to take a break from my usual routine of coming up with the ideas, designs, and project samples for others to follow. It's important to note that Paper Pumpkin is NOT a monthly card-making kit. 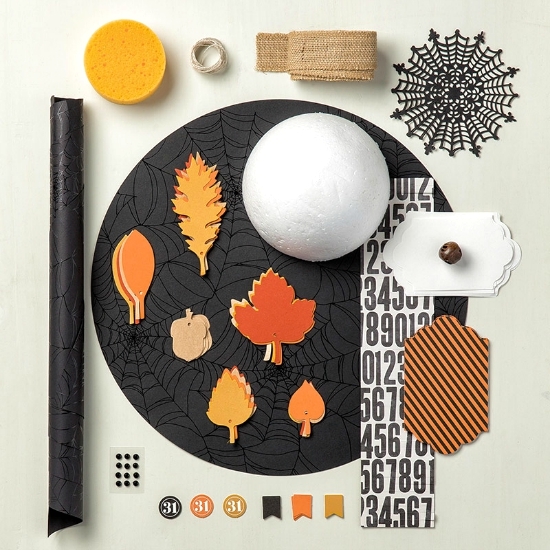 Paper Pumpkin is a monthly paper-crafting kit that may include cards, boxes, journals, bags, tags, and more. This is one of the many things I like about the kits - the variety of projects. Another thing I really enjoy is that most of the time, the kits include some exclusive products that you can only get through Paper Pumpkin. And as a subscriber, you are often times able to purchase past kits (miss a month? no problem!) or past kit refills (supplies minus the stamp set and ink). Are you ready to join the fun? Subscribe Now! Did you enjoy today's project? Share your comments below! Do you love decorating for Halloween? Are you excited to find new "spooky" decorations to add to your Halloween collection? Maybe you just enjoy creating fun Halloween crafts on your own, whether for parties or trick-or-treating. 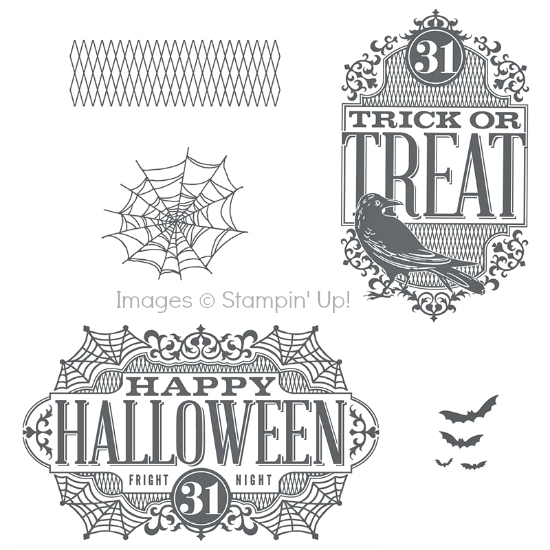 If you are nodding in agreement, let me introduce the Witching Decor Project Kit by Stampin' Up! With this kit you'll create one witch hat centerpiece (or decor piece) that you'll be able to store and use again and again. And let me tell you - if you are already in love with this project, just wait until you see it in person! It's stunning ... in an eerie, yet adorable way. The finished piece is approximately 13" x 13" and the base is chipboard. It's fairly sturdy, although part of the charm of this witch hat is that it's a little crumply so if it gets scrunched a bit during storage it won't really matter. You will have a few extra pieces left over from the kit - enough to make a few cards, tags, or treat toppers - let your spooky imagination run wild! Get your boo on! 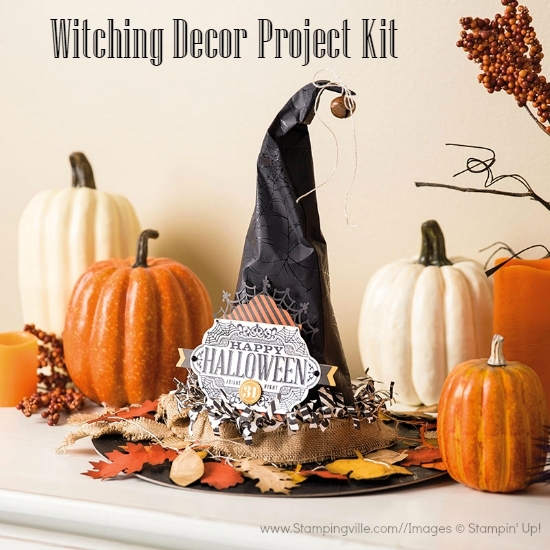 Shop now for the Witching Decor Project Kit. In the video below, watch how to create the witch hat using the project kit including a few good-to-know tips and tricks for assembly. 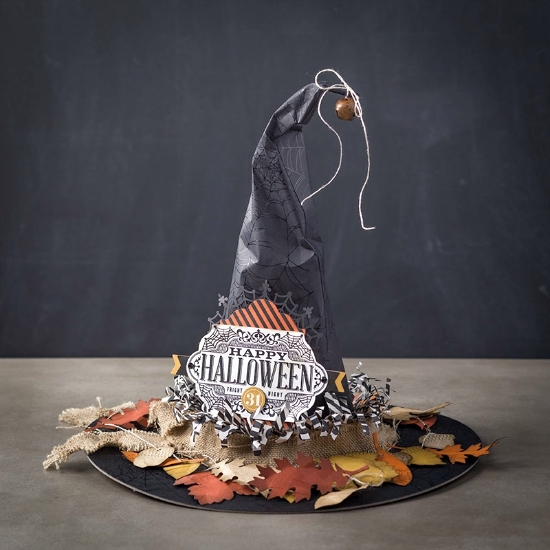 I love this DIY Witch Hat Halloween project. It will look great along with my Halloween Wreath from last year. If you missed out on the Frightful Wreath Simply Created Kit, it's on sale now in the Clearance Rack section of the Online Store (while supplies last). Why not get both DIY projects and go all out for Halloween this year. All your friends might be jealous, but they'll get over it. Ha ha! Holiday Fun Begins Now With Stampin' Up! Let the fun begin - the Stampin' Up! 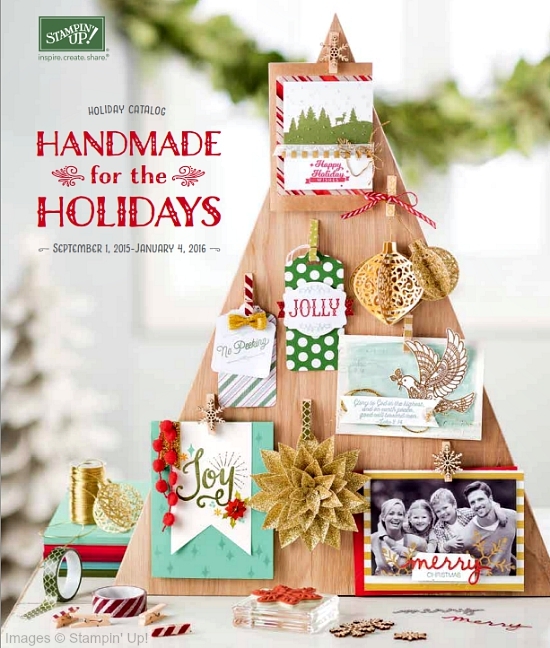 2015 Holiday Catalog is live. Ohmygosh. Just wait until you see the awesome new stamp sets, dies, embellishments, and accessories available this holiday season from Stampin' Up! Can't wait? View the Holiday Catalog HERE. Go ahead - I'll wait here - then we'll chat. Did you see all that glorious craftiness? My head was spinning with so many crafty ideas after seeing the catalog. If you're like me, you'll need to look a few more times to take it all in. And, of course, you'll want to have your wish list handy so you don't forget a thing. I'll be sharing projects, videos, tips, and tricks in the weeks and months to come, but today I want to point out a few "don't miss" highlights. Project Kits: Back by popular demand, there are four new holiday project kits available. *Additional products required to complete kits as shown. For a list of supplies, refer to the Holiday Catalog or the Holiday Kits section of the Online Store. Product Suites: Collections of products that coordinate perfectly for easy creating. No guessing about which colors, designs, and accents go together - the work has already been done for you. Home for Christmas - Make it cozy with vintage winter and Christmas hand-drawn imagery. 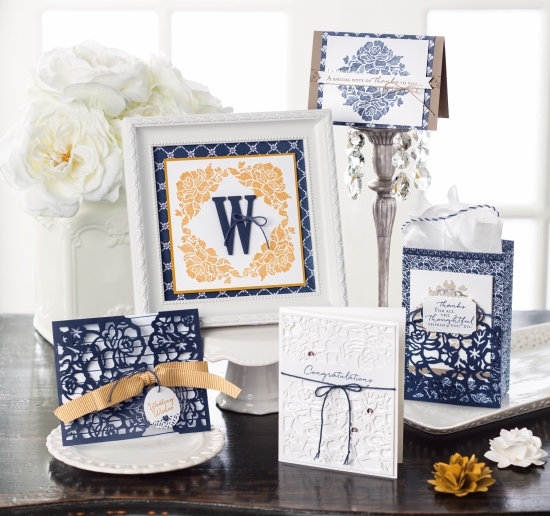 Winter Wonderland - A blend of simple elegance, a touch of gold, and serene beauty. Season of Cheer - Cheerful feelings of the season paired with the soft look of watercolor. 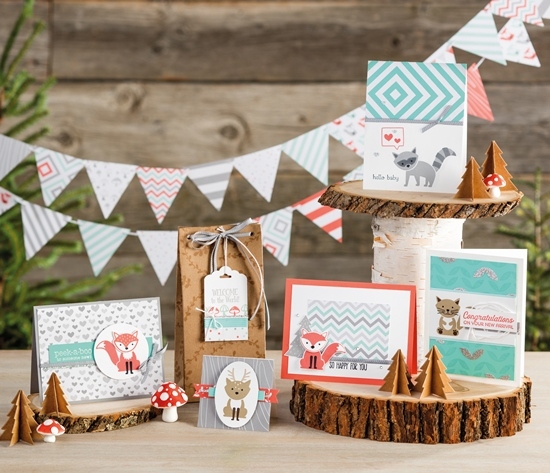 Into the Woods - Cute forest friends, earthy colors, and hand-painted imagery bring fall projects to life. Happy Haunting - Traditional Halloween colors infused with fun patterns and not-so-spooky characters. Project Life - Hello December 2015 for daily journaling of special moments throughout December. 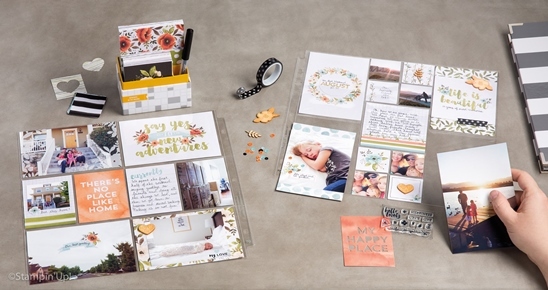 Project Life - Seasonal Snapshot 2015 is the perfect memory-keeping solution for everything from back-to-school to Christmas and everything in-between. Bundle and Save: Coordinating products designed to be used together and offered as a bundle with 15% savings. Choose from 17 new bundles in the Holiday Catalog. 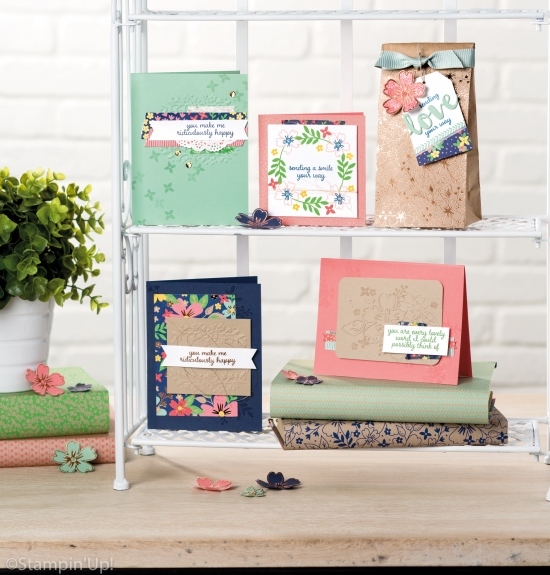 Exclusive Stamp Sets: Two new exclusive stamp sets available only to hosts or with a qualifying order of $150 or more. Create vintage tags and labels with the Antique Tags stamp set or choose the Six Sayings stamp set with greetings to use for fall and winter occasions. Is your wish list ready? Shop now for Holiday Catalog products. And remember to check out the Weekly Deals and the Clearance Rack while you are there. What is your must-have item in the Holiday Catalog? Share your comments below! 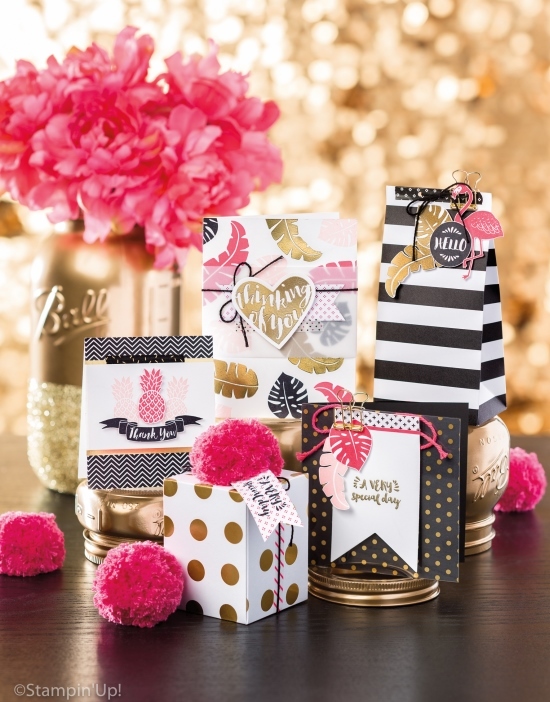 If you liked the cute little bows on yesterday's Birthday Bow Card/Box ensemble, you're going to love seeing all the different styles of bows you can create with just one punch. Yep, those little bows are really that easy to create using the punch. I definitely recommend using Glue Dots - it's so quick and easy and no mess. If you don't have a bone folder, (gasp!) get one immediately. Just kidding. Okay, not really. If you are a card maker or like to make 3D items like boxes or bags or a project with lots of scoring, you really should have a bone folder in your basic tool kit. You'll be amazed at the clean, crisp folds you'll get and wonder why you waited so long. If you still don't have a bone folder, try wrapping the bow pieces around a pencil to get the desired bend in the loop pieces. 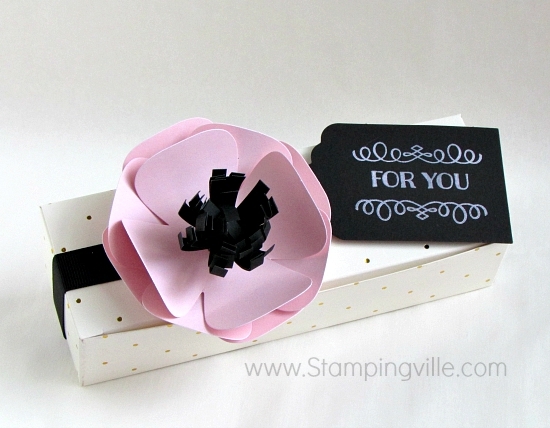 There are endless ways to combine the bow pieces created with the Stampin' Up! Bow Builder Punch. 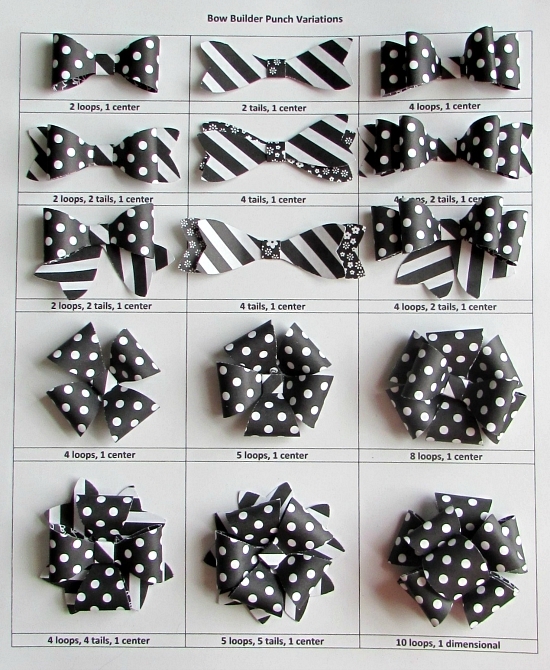 The chart below shows 15 variations of unique bows you can easily create for cards, tags, gifts, and other papercraft projects. Try mixing and matching patterned paper or combining patterned paper with solid colors for even more variations of this cute DIY mini paper bow. A big thank you to Brenda Quintana for sharing her bow builder punch chart. I ran across it one day and quickly went to work to create all the bows and fill up my own chart. I shared this idea at a recent Stampin' Up! team meeting and everyone got to make their own bows and fill their own chart to share with their customers. Everyone loved it!